To deliver great products, you need a great agile team. This course will teach you how to foster collaboration across your team, communicate your team's progress to your broader organization, and encourage self-organization within your team. A team is more than just a group of individuals who share a space. A true team is a group of individuals with complementary skills who are working together towards a shared goal. In this course, Empowering Your Team with ICAgile, you will gain the skills necessary to help your team reach their highest potential. First, you will learn effective strategies for promoting better teamwork across your team. Next, you will discover the benefits of accurately communicating your team's progress both inside and outside of your team, as well as learn techniques for doing so. Finally, you will explore how to encourage your team to take on a more self-organizing stance and learn what changes must occur in your organization to support this new level of self-organization. 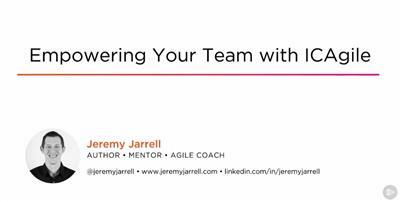 When you're finished with this course, you will have the skills and knowledge of agile team leadership needed to help your team take control of their own destiny, as well as to enable them to make a more meaningful impact inside of your organization.